OIA Residences ... handed over to home-owners. OIA Residences, a Grecian-themed residential community located in Dubai Motor City, was recently handed over to the home-owners by Union Properties, its developer. The project, which boasts a unique Mediterranean charm that is rarely found in the region, is inspired by Oia, a small, quaint town on the island of Santorini in Greece that is famous for its bright white buildings and blue skies, says an official for Union Properties. The Dh450-million ($122 million) project features 269 one to four-bedroom apartments, of which 30 are premium three- and four-bedroom duplexes that come equipped with lush gardens and private terraces that have exclusive access to the swimming pools. OIA Residences has gained tremendous interest from investors and end-users looking for a charming living experience in the heart of Motor City, Ahmed Yousef Khouri, board member of Union Properties, tells ABDULAZIZ KHATTAK of Gulf Construction. Khouri says the ultra-chic development combines the luxury of low-rise apartment living with the benefits of a community lifestyle. Each unit has been immaculately designed, with spacious floor plans and naturally bright living spaces. Residents also have access to extensive fitness facilities, including two outdoor swimming pools, a fully-equipped gym, a squash court and jogging trails, along with multiple dining, retail and entertainment facilities located just a short walk away. Since its inception, Dubai Motor City has quickly established itself as a premium lifestyle destination in Dubai. The ‘city within a city’ spans over 38 million sq ft, and is home to First Avenue Mall, The Ribbon, Uptown, Green Community Motor City, and Dubai Autodrome – a key destination for motorsport enthusiasts in the region. Union Properties has a 30-year track record of delivering iconic residential developments, having delivered well over 10,000 homes and 25 projects all around Dubai. The company has built some of the most notable communities in the area, including Motor City, Green Community in Dubai Investments Park (DIP) and Uptown Mirdif, one of the earliest built communities that offer its residents a premium living experience. 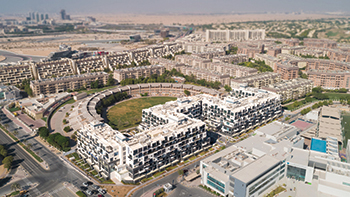 Its commitment to delivering top-notch customer service, first-class infrastructure and sustainable living spaces has resulted in Union Properties being recognised as a trusted developer in the region, which has expanded its offerings outside of the residential space to commercial, industrial and leisure developments.